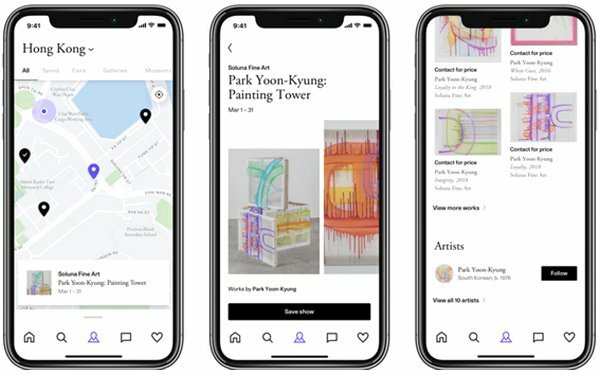 In partnership with auto company BMW, digital art platform Artsy is introducing a new city guide feature that will allow users to explore six international cities and buy art directly from exhibits and fairs in those cities via the Artsy iOS app. Artsy, an art marketplace and publisher formed in 2012, partners with over 3,000 international galleries, auction houses, art fairs and museums in over 90 countries. Launching in the app store March 25, the new art guide feature lets users explore gallery exhibitions, art fairs and museum shows in New York, London, Hong Kong, Paris, Los Angeles and Berlin. Previously, users could purchase art through the app, but this new feature allows users to explore cities through the guides, browse images from exhibits and information on shows, and purchase works. Users can explore the shows in-person or virtually. Fatma Collins, Artsy’s vice president of product, called the feature "a seamless and personalized discovery-to-collect experience. By providing greater access to and deeper engagement with art, this initiative further builds on Artsy’s goal to increasingly support more artists in the world and make more art accessible to art lovers and buyers on a global scale." The app is getting more personalized, too. Artsy users will get a curated selection of artists and artworks based on their preferences, which they can save and explore their shows. An augmented reality feature allows users to virtually place artworks from the shows on their own walls at home. The feature will also include selected private collections from the BMW Art Guide. Users can find fair activations by BMW, including displays of vehicles of the BMW Art Car Collection. The city guide feature is part of a multichannel partnership between Artsy and BMW. An ongoing film series produced by the two companies, called the “Future of Art,” profiles artists and creatives like Trevor Paglen, Carrie Mae Weems and Elizabeth Diller. BMW and Artsy are hosting a party in Hong Kong on Wednesday, March 27, to debut the city guide feature, timed to coincide with the city's Art Basel. The BMW Group has taken part in more than 100 cultural partnerships, including contemporary and modern art, classical music and jazz and architecture and design.